This bibliography lists books and articles by and about The Marx Brothers, as well as books containing work by The Marx Brothers. This is mainly a list of the materials referred to in the creation of this site, so it is by no means complete. 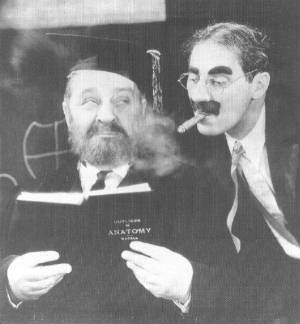 For an absolutely exhaustive bibliography, visit The Marx Brothers Bibliography. Also, many of these books, as well as others not listed, plus videos, laser discs, CDs, and cassettes may be ordered through the Marxist Shop page. Adamson, Joe, "Groucho, Harpo, Chico and Sometimes Zeppo: A Celebration of the Marx Brothers" (New York, Simon and Schuster, 1973). Anobile, Richard J., "Hooray for Captain Spaulding! Verbal and Visual Gems From "Animal Crackers" (New York, Darien House, Inc., 1974). __________, "Why A Duck?" (New York, Darien House, Inc., 1971). Bader, Robert S. (editor) "Groucho Marx and Other Short Stories and Tall Tales: Selected Writings of Groucho Marx" (New York, Faber & Faber, 1993). Barson, Michael (editor), "Flywheel, Shyster, and Flywheel: The Marx Brothers' Lost Radio Show" (New York, Pantheon Books, 1988). Cerf, Bennett (editor), "An Encyclopedia of Modern American Humor" (New York, Hanover House Doubleday & Co., 1954). Chandler, Charlotte, "Hello, I Must Be Going: Groucho and His Friends" (New York, Doubleday, 1978). Crichton, Kyle, "The Marx Brothers" (London, Heinemann, 1951). Eyles, Allen, "The Complete Films of The Marx Bros." (New York, Citadel Press, 1992). __________, "The Marx Brothers: Their World of Comedy" (Cranbury, New Jersey, A.S. Barnes and Co., 1966). Goulart, Ron, "Groucho Marx, Master Detective" (New York, St. Martin's Press, 1998). Hopkins, Jay (editor), Re:Marx: The Official Magazine of the Marx Brotherhood, St. Paul, Minnesota. Marx, Arthur, "Groucho" (London, Victor Gollancz, 1954). Marx, Groucho, "Groucho and Me" (New York, Bernard Geis Associates, 1959; London, Victor Gollancz, 1959). __________, "Memoirs Of A Mangy Lover" (New York, Bernard Geis Associates, 1965). __________, "The Groucho Letters" (London, Michael Joseph, 1967). __________, "The Groucho Phile, an Illustrated Life" (New York, Bobbs-Merrill, 1976). Marx, Groucho, and Richard J. Anobile, "The Marx Brothers Scrapbook" (New York, Darien House, 1973). Marx, Groucho with Hector Arce, "The Secret Word is Groucho" (New York, G.P. Putnam's Sons, 1976). Marx, Harpo (with Rowland Brown), "Harpo Speaks!" (London, Victor Gollancz, 1961). Marx, Maxine, "Growing Up With Chico" (Englewood Cliffs, New Jersey, Prentice-Hall, 1980). Marx, Miriam, "Love, Groucho: Letters from Groucho Marx to His Daughter Miriam" (Winchester, Massachusettes, Faber and Faber, Inc., 1992). Mitchell, Glenn, "The Marx Brothers Encyclopedia" (London, B.T. Batsford, Ltd., 1996). Muir, Frank, "The Oxford Book of Humorous Prose: From William Caxton to P.G. Wodehouse" (Oxford, New York, Oxford University Press, 1990). Richler, Mordecai (editor), "The Best of Modern Humor" (New York, Alfred A. Knopf, 1983). Stoliar, Steve, "Raised Eyebrows: My Years Inside Groucho's House" (Santa Monica, CA, General Publishing Group, Inc., 1996). Tiersma, Peter M., "Language-Based Humor in the Marx Brothers Films" (Bloomington, Indiana, Peter Meijes Tiersma, 1985). Wesolowski, Paul G. (editor), The Freedonia Gazette: the Magazine Devoted to the Marx Brothers, New Hope, Pennsylvania. Zimmerman, Paul D. and Burt Goldblatt, "The Marx Brothers at The Movies" (New York, G.P. Putnam's Sons, 1968).